Abstract: Because neuroticism is not represented on the Interpersonal Circumplex, instances of it in social interactions, such as socially anxious behavior, might be presumed to be irrelevant to complementarity. In contrast, the present work evaluates the possibility that complementarity is impacted if one member of the dyad shows socially anxious behavior. A total of 95 participants interacted with a confederate who displayed high or low levels of agreeableness and high or low levels of socially anxious behavior. Participants indicated the types of interpersonal responses they had towards the confederate, and independent raters coded the behavioral responses participants actually displayed. Although the confederate's socially anxious behaviors did not impact the extent to which reciprocity occurred on the dominance dimension, they did have a substantial impact on the extent to which correspondence occurred on the affiliation dimension. Participants' affiliative reactions were significantly less correspondent when the confederates displayed socially anxious behaviors than when they did not. Interestingly, participants responded with relatively high levels of affiliation towards a socially anxious confederate regardless of whether the confederate was agreeable or disagreeable. This pattern of results suggests both important qualifications to the principle of interpersonal complementarity and possible merits of incorporating a neuroticism dimension in conceptions of interpersonal style. The interpersonal circumplex (IPC) dimensions of dominance and affiliation relate to other theories of personality, such as the Big Five (Costa & Widiger, 1994; Pincus & Gurtman, 1995; Wiggins & Pincus, 1994). More specifically, dominance and affiliation can be regarded as rotational variants of the two Big Five factors of agreeableness and extraversion. Because the IPC is two-dimensional, and the Big Five are theorized to be orthogonal to each other, it seems that there is no room on the IPC for the remaining Big Five traits of conscientiousness, openness, and neuroticism. Although the theoretical structures of the Big Five Factor model and the IPC seem to imply that the remaining Big Five traits do not have an interpersonal role, conceptually it seems that these traits should influence individuals’ interpersonal relations. In the current work, we focused on how the Big Five trait of neuroticism, exhibited through socially anxious behavior, and the Big Five trait of agreeableness impacts interpersonal complementarity. There is a substantial amount of literature to support the idea that neuroticism is an interpersonally relevant trait. In relationships, individuals who are high in trait neuroticism experience higher degrees of conflict, higher dissolution rates, and lower levels of support (Ozer & Benet-Martinez, 2006; Widiger, 2009). Research on the impact of social anxiety, one type of neurotic behavior, also lends support to the idea that neuroticism plays a significant role in interpersonally relevant situations. For example, people with social anxiety develop fewer social relationships, and when they do develop social relationships, these relationships are less intimate, functional, and satisfying than relationships of people without social anxiety (Alden & Taylor, 2004). Even in brief interactions between unacquainted dyads, others are less likely to desire future interactions with socially anxious individuals (Meleshko & Alden, 1993). If neuroticism is indeed an interpersonally relevant trait, as the literature suggests, then instances of it, such as social anxiety, should influence interpersonal processes. In the current research, we examined whether anxious behavior impacts the interpersonal process of complementarity, defined by oppositeness (or reciprocity) on the dominance dimension and sameness (or correspondence) on the affiliation dimension (Kiesler, 1996). To investigate this idea, we examined whether individuals responded differently toward agreeable and disagreeable behavior when accompanied by a presence or absence of anxiety. In other words, does anxious behavior moderate the way people respond to agreeableness? We chose to investigate agreeable and disagreeable behaviors because of the interpersonal nature of the trait of agreeableness. For example, highly agreeable individuals are often quite successful in interpersonal relationships. They tend to have rapport with their interaction partners and in turn agreeable individuals are often met with invitations to form future relationships from their interaction partners (Cuperman & Ickes, 2009). Another reason why we chose to investigate responses towards agreeable and disagreeable behaviors expressed either anxiously or calmly is because correspondent and reciprocal reactions towards agreeable and disagreeable behaviors can be predicted by the IPC. The Big Five factor of agreeableness can be represented as an axis on the IPC, with agreeable interpersonal behavior falling in the friendly-submissive quadrant, and disagreeable interpersonal behavior falling in the hostile-dominant quadrant. According to the principles of reciprocity and correspondence, agreeable interpersonal behavior should pull for more friendly and dominant responses from interaction partners, whereas disagreeable interpersonal behavior should pull for more hostile and submissive responses from interaction partners (see Figure 1). Figure 1. Illustration of correspondent and reciprocal responses towards agreeable and disagreeable interpersonal behaviors. We expected, consistent with the principles of reciprocity and correspondence that participants would respond with more dominance and affiliation towards agreeable behavior and more submissiveness and hostility towards disagreeable behavior. However, we hypothesized that by infusing the expressed agreeable and disagreeable interpersonal behaviors with anxiety, patterns of reciprocity and correspondence towards agreeable and disagreeable behaviors would be altered. In this study, a total of 95 undergraduate students (63 females, 32 males) were randomly assigned to interact with a confederate. The cover story of the experiment required the confederate to deliver a presentation and the participant to evaluate the presentation. In addition, after the confederate delivered the presentation, the confederate and participant were left alone in a room for 45 seconds. All of the research sessions were video and audio recorded. The way in which the confederate delivered the presentation and acted throughout the research session served as the experimental manipulation. More specifically, the confederate’s behaviors differed in agreeableness (High vs. Low) and social anxiety (High vs. Low). The behaviors displayed by the confederate in each of the four conditions were consistent with personality, interpersonal theory, and social anxiety literature (e.g., Alden & Taylor, 2004; Kiesler, 1996; Widiger, 2009). For example, in the “high agreeable–high anxiety” condition, the confederate smiled and engaged the participant, while also displaying socially anxious mannerisms (such as trembling and long conversational pauses). In contrast, in the “disagreeable–low anxiety” condition, the confederate behaved in an abrupt and impolite manner, while also displaying behaviors consistent with someone who is at ease (such as fluid speech and a relaxed body posture). Prior to beginning data collection, videotapes of the confederates’ performances in each of the four conditions were rated by senior graduate students to ensure that the manipulations were salient and the two confederates involved in the study did not differ on how believable or natural they appeared in their roles. Figure 2. Participants’ self-reported dominant responses to the confederate. To examine whether anxious behavior impacted patterns of reciprocity in dominance, we performed 2 (agreeable vs. disagreeable) X 2 (high vs. low social anxiety) ANOVAs with participants’ self-reported dominant responses and observer-coded dominant responses as the dependent variables. Recall that a reciprocal response towards agreeable interpersonal behavior is dominance, and a reciprocal response towards disagreeable interpersonal behavior is submissiveness. For self-reported dominant responses towards the confederate (Figure 2), there was a main effect of agreeableness, F(1,93) = 17.13, p < .001, η² = .16. Participant reports suggested that they responded in a reciprocal way towards agreeable and disagreeable behaviors from the confederate. That is, participants reported more submissive responses to disagreeable behavior from the confederate and more dominant responses towards agreeable behavior from the confederate, regardless of confederate level of anxious behavior. Surprisingly, patterns of reciprocity towards agreeable and disagreeable interpersonal behaviors were not impacted by the confederate’s anxiety level. That is, the similarity in slopes of the red and blue lines in Figure 2 shows that participants responded in similarly reciprocal ways to the high-anxiety confederate as to the low-anxiety confederate. Figure 3. Observer-coded dominant responses of the participant towards the confederate. To examine whether anxious behavior impacted patterns of affiliative correspondence, we performed 2 (agreeable vs. disagreeable) X 2 (high vs. low social anxiety) ANOVAs with participants’ self-reported affiliative responses and observer-coded affiliative responses as the dependent variables. Recall that a correspondent response towards agreeable interpersonal behavior is affiliation, and a correspondent response towards disagreeable interpersonal behavior is hostility. 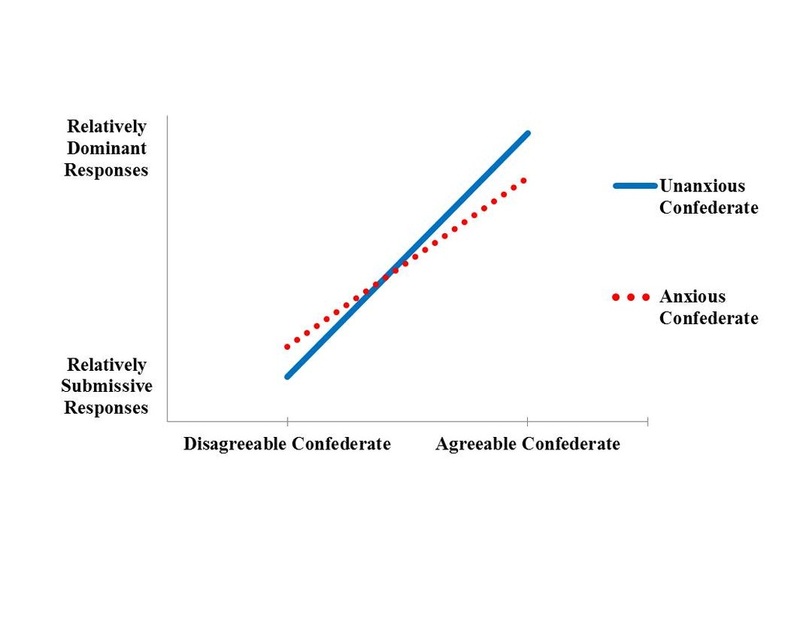 For self-reported affiliative responses towards the confederate (Figure 4), there was a main effect of agreeableness, F(1, 93) = 8.85, p = .004, η² = .09: Participant reports suggested that they responded in a correspondent way towards agreeable and disagreeable behaviors from the confederate. That is, participants reported more affiliative responses towards agreeable behavior from the confederate and more hostile responses towards disagreeable behavior from the confederate, regardless of confederate’s level of anxious behavior. Additionally, there was a main effect of confederate anxiety level, F(1, 93) = 47.14, p < .001, η² = .34: Participant reports indicated that they responded with more affiliative responses towards the high-anxiety confederate than the low-anxiety confederate. Both of these main effects were qualified by a significant interaction between the agreeableness level of the confederate and the anxiety level of the confederate, F(1,93) = 7.09, p = .009, η² = .07. As shown by the steeper slope of the blue line in Figure 4, participants had a much stronger correspondent reaction towards the low-anxiety confederate than the high-anxiety confederate, shown by the red line with a much flatter slope. Figure 4. Participants’ self-reported affiliative responses to the confederate. 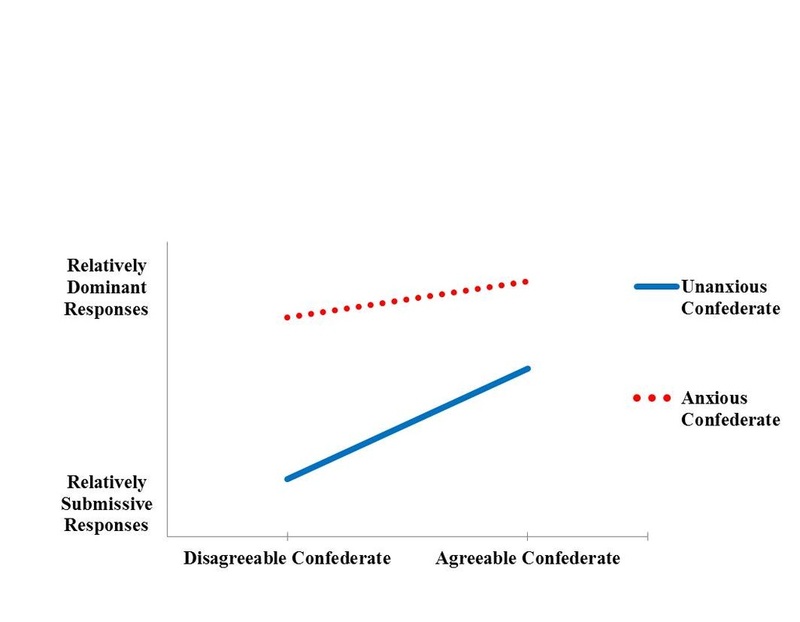 For observer-coded affiliative responses (Figure 5), participants were perceived as responding in a correspondent way towards agreeable and disagreeable behaviors from the confederate. That is, participants were seen as responding with more affiliation when the confederate was engaging in agreeable behaviors and more hostility when the confederate was engaging in disagreeable behaviors, F(1, 83) = 33.34, p <.001, η² = .29. Similar to what participants reported, there was a significant interaction between the agreeableness level of the confederate and the anxiety level of the confederate, F(1,83) = 6.92, p = .010, η² = .08. As shown by the steeper slope of the blue line in Figure 5, participants were coded as having a more correspondent reaction towards the low-anxiety confederate than the high-anxiety confederate, shown by the slope of the red line. Figure 5. Observer-coded affiliative responses of the participant towards the confederate. To summarize the results, the anxiety level of the confederate did not impact the extent to which reciprocity occurred on the dominance dimension: Regardless of the confederate’s anxiety level, participant reports suggested that they responded in a reciprocal way towards the confederate. Participants reported responding with more dominance towards a confederate enacting agreeable behaviors and responding with more submissiveness towards a confederate enacting disagreeable behaviors. Furthermore, observer reports concurred with this pattern. 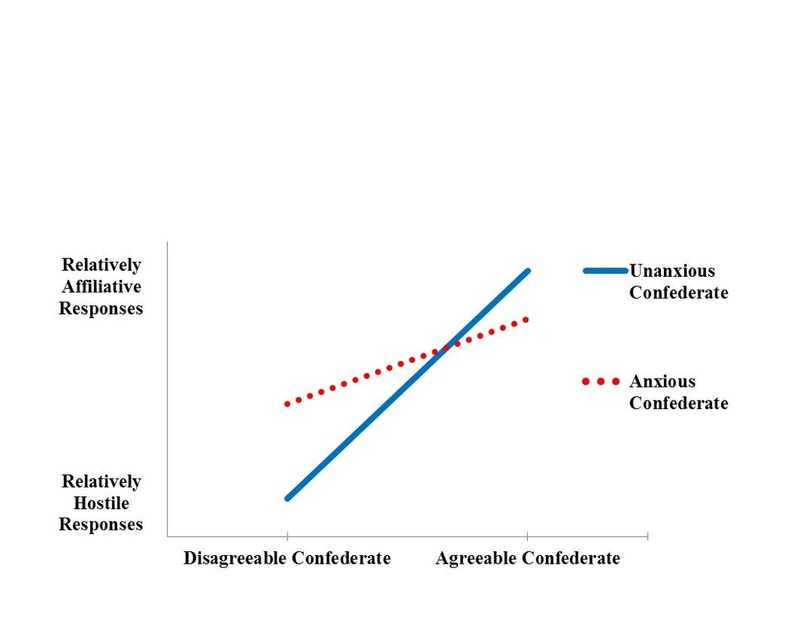 In contrast, the anxiety level of the confederate appeared to interfere with patterns of correspondence on the affiliation dimension: Although participants responded with more affiliation towards agreeable behaviors from the confederate and more hostility towards disagreeable behaviors from the confederate, this expected pattern of correspondence only occurred when participants were interacting with the low-anxiety confederate. 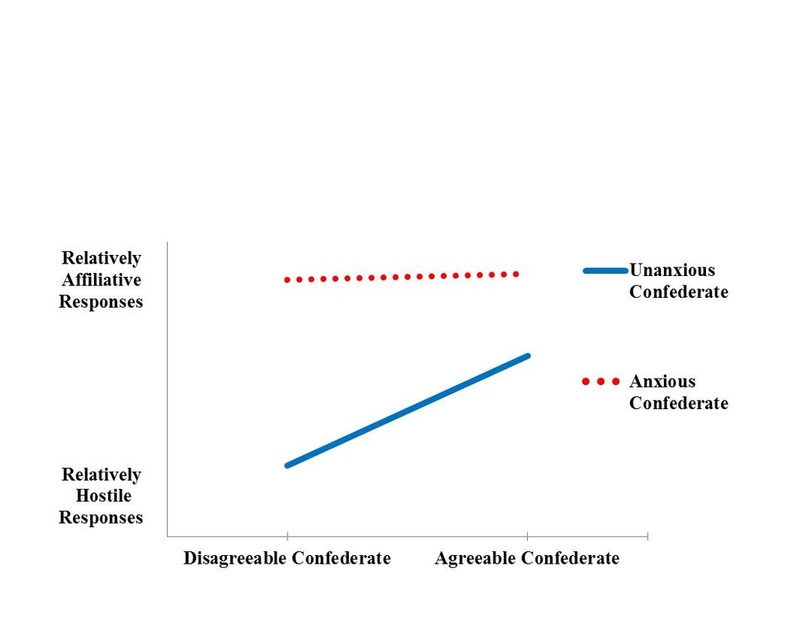 Participants' affiliative responses towards the confederate were significantly less correspondent when participants were interacting with the anxious confederate. Interesting differences also emerged between participants’ overt (i.e. observer-coded behaviors) and self-perceived responses. Although observers saw more dominant behaviors from participants in response to a high-anxiety confederate than a low-anxiety confederate, participants seemed to be unaware of this pattern, rating their dominance responses towards the confederate about the same regardless of the confederate’s anxiety level. Instead, participants tended to see themselves as responding with more affiliation towards the high-anxiety confederate than the low-anxiety confederate, even though observers saw no such difference. This research allowed us to begin to address the question of whether the natural complementarity that occurs when two people interact is impacted by anxiety behaviors. In the present work, the degree of complementarity shown was restricted to one direction only. That is, this work investigated the degree of complementarity shown by participants in response to scripted confederate behavior. An interesting next step is to investigate the degree of complementarity exhibited between two participants (rather than between participant-confederate dyads). Accordingly, we are currently investigating if anxiety has a similar impact on patterns of complementarity in interactions in which both members of the dyad are free to act and react to each other’s behaviors and interpersonal cues. One possible explanation for why patterns of correspondence are weakened when someone in an interaction is anxious is that both members of the dyad could be overlooking their partner’s interpersonal bids for correspondence. For example, if the unanxious partner is distracted by the anxiety of the anxious partner, the unanxious partner could miss interpersonal cues from their anxious partner, impairing the extent to which the interaction partners are calibrating their affiliation levels towards one another. This research is the beginning of an interesting exploration into clarifying how anxiety influences the ways in which behaviors of pairs of people fit together during interpersonal interactions. The results of this research suggest that people’s anxiety behaviors, and the broader construct of neuroticism, ought to be considered when investigating interpersonal processes. Alden, L. E., & Taylor, C. T. (2004). Interpersonal processes in social phobia. Clinical Psychology Review, 24(7), 857- 882. Costa P. T., & Widiger, T. A. (1994). Personality disorders and the five-factor model of personality. Washington: American Psychological Association. Cuperman, R., & Ickes, W. (2009). Big five predictors of behavior and perceptions in initial dyadic interactions: Personality similarity helps extraverts and introverts but hurts “disagreeables.”Journal of Personality and Social Psychology, 97(4), 667-684. Kiesler, D. J. (1996). Contemporary interpersonal theory and research: Personality, psychopathology, and psychotherapy. New York: Wiley. Meleshko, K. G. A., & Alden, L. E. (1993). Anxiety and self-disclosure: Toward a motivational model. Journal of Personality and Social Psychology, 64, 1000-1009. Ozer, D. J., & Benet-Martinez, V. (2006). Personality and the prediction of consequential outcomes. Annual Review of Psychology, 57, 401- 421. Pincus, A. L., & Gurtman, M. B. (1995). The three faces of interpersonal dependency: structural analyses of self-report dependency measures. Journal of Personality and Social Psychology, 69(4), 744. Widiger, T. A. (2009). Neuroticism. In M. R. Leary & R. H. Hoyle (Eds. ), Handbook of individual differences in social behavior (pp. 129 – 146). New York: Guilford. Wiggins, J. S., & Pincus, A. L. (1994). Personality structure and the structure of personality disorders. In P. T. Costa & T. A. Widiger (Eds,), Personality disorders and the five- factor model of personality (pp. 73 – 93). Washington: American Psychological Association. Correspondence concerning this article should be addressed to Kelly McDonald.